Heat oven to 350°F. Spray 24 mini muffin cups with cooking spray. Place 1 dough round in each muffin cup. Bake 10 to 13 minutes or until edges are golden brown. Remove from oven, and immediately press indentation into each cookie cup with end of wooden spoon. Cool completely in pan, about 20 minutes. Run knife around edges of cups to loosen; gently remove from pan. 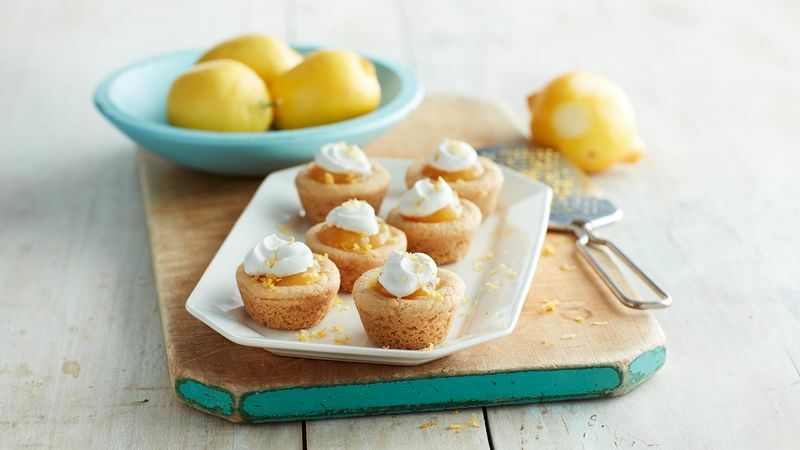 Spoon 1 tablespoon lemon curd into each cookie cup, and top with 1 tablespoon whipped cream. Top with lemon peel. Refrigerate until ready to serve. Reserve remaining lemon curd in refrigerator for a later use. Separate cookie dough easily using a knife.